I took this expecting to use it as a Sky Watch photo, but it fits here nicely. I can’t pause to make links. You’re right! That is a perfect fit for K. The kite looks like it’s just going to keep soaring right out of the photo. 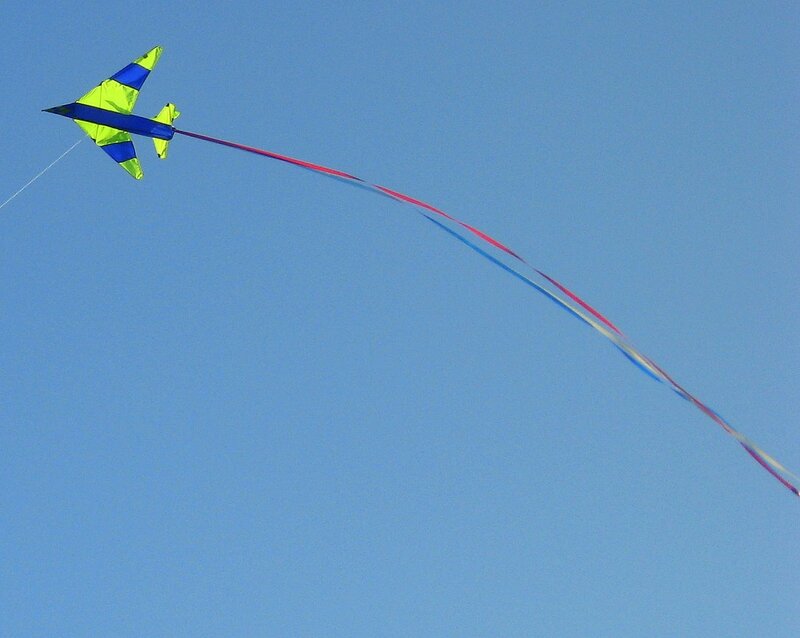 I had THOUGHT about kites… but we haven’t had enough wind for Luz and I to fly hers yet! THAT is a definite benefit to living near the ocean! Wind! That kite’s a doozy! Beautiful with the curved tail. Like a cloud dog. Horsoon — the joy on the face of the child hoolding this kite’s string would have definitely lifted your gaze skyward. Karen — in a couple of my shots it did just that! Melli — here, the wind is vital. On windless days we all simmer in our own sweat. Doug — thank you. That tail was doing a lot of dancing, making the momma of the small boy working the kite a bit nervous. I love the way you have the curve round the picture. Well balanced! Juliana — if only I could fly like a kite (though I am willing to skip the crashing into trees and power line stuff). Wow – you even got the twist of the tail. Really, really good! Well done. That thing looks mighty similar to the jets that fly overhead daily. If those jets ever trail tails like that kite, I am headed for a cave. Another one you could have incorporated for more than one theme! I love how the colors of the kite work with the sky. Nice capture. Cath — luck, but thanks. Robert — the colors are what first drew me to raise my camera. Thanks. Good choice. Great picture. Sorry I didn’t stop by yesterday but I was really sick. Dr. John — I’m glad you’re up and feeling better. Zingtrail — thank you, I am glad you enjoyed. Merisi — Mr. Linky is only for the people playing in the Alphabet Challenge. That is how they find one another. However, if you want this version of Mr. Linky to open you have to click on him. I haven’t paid for the fancy kind because I am a poor teacher who has lost enough time and money to this addiction hobby called blogging.